The musculoskeletal system includes bones, joints, skeletal muscles, tendons, and ligaments. Muscles generate force; tendons transfer it to bones; and the bones move if enough force is transmitted. The force must be enough to overcome the weight of the moving body part, gravity, and other external resistance. Motion occurs at joints associated with one or both ends of the bone. Classes of levers. (a) In a first-class lever, the fulcrum (F) is set up between the resistance (R) and the effort (M). (b) In a second-class lever, the resistance is between the fulcrum and the effort. (c) In a third-class lever, the effort is between the fulcrum and the resistance. to other muscles, or to fascia, which are connective tissue sheets between muscles. The surfaces of the bone making up the joint have a layer of hyaline cartilage, the articular cartilage, which forms a smooth surface for easy movement. Bone ends may be surrounded by a joint capsule, which secretes fluid for lubrication and nutrition. Joint motion is usually pain free, but age, injury, and some diseases damage the articular cartilage, resulting in arthritis. Biomechanics applies the principles of physics to human movement. Some joints work like levers, others like pulleys, and still others like a wheel-axle mechanism. Most motion uses the principle of levers. A lever consists of a rigid "bar" that pivots around a stationary fulcrum . In the human body, the fulcrum is the joint axis, bones are the levers, skeletal muscles usually create the motion, and resistance can be the weight of a body part, the weight of an object one is acting upon, the tension of an antagonistic muscle, and so forth. Levers are classified by first, second, and third class, depending upon the relations among the fulcrum, the effort, and the resistance. First-class levers have the fulcrum in the middle, like a seesaw. Nodding the head employs a first-class lever, with the top of the spinal column as the fulcrum. Second-class levers have a resistance in the middle, like a load in a wheel-barrow. The body acts as second-class lever when one engages in a full-body push-up. The foot is the fulcrum, the body weight is the resistance, and the effort is applied by the hands against the ground. 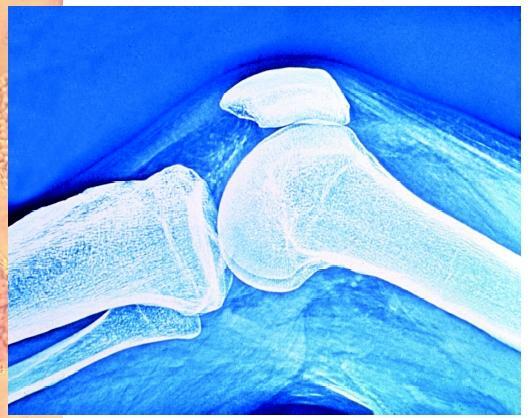 An X ray of the human knee joint with the patella, the bone located within the quadriceps tendon, which wraps over the front of the knee, forming the kneecap. to the joint. As the length of the lever increases, the possible speed increases, but so does the force required to produce it. For instance, the forearm is a third-class lever, controlled by the biceps muscle. A longer forearm can produce faster motion of the hand, but requires more effort to move than a shorter forearm. A few muscle-bone connections work on the principle of a pulley, which changes the direction of an applied force. A classic example is the patella (kneecap), which alters the direction in which the quadriceps (patellar) tendon pulls on the tibia. Muscles play four roles in producing joint movements: agonist (prime mover), antagonist, synergist, and fixator. A given muscle can play any of these roles, often moving from one to the next in a series during an action. Agonists and antagonists are opposing muscles. This means that when an agonist creates tension, the antagonist produces an opposing tension, thereby contributing to control at the joint. When one lifts a glass of water from the table to one's mouth, for example, the biceps brachii muscle acts as an agonist to flex the elbow, while the triceps brachii acts as an antagonist to keep the elbow from flexing too fast or too far. Synergists aid the motion of an agonist. Although every musculotendinous unit (muscle belly and tendons attaching it to the bone) has a specific name, it is common to group muscles according to the motion they create. Flexors create motion that would bring the distal segment closer to the torso, while abductors cause a limb to move laterally , away from the body. Kreighbaum, Ellen, and Katharine Barthels. 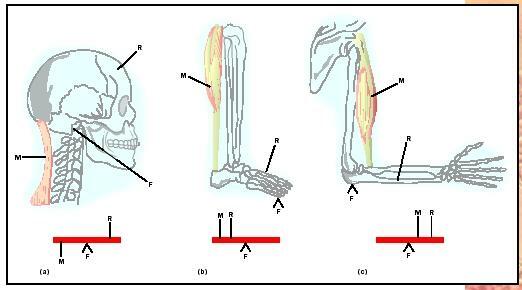 Biomechanics: A Qualitative Approach for Studying Human Movement. New York: Allyn and Bacon, 1996. Marieb, Elaine. Essentials of Human Anatomy and Physiology. San Francisco, CA: Benjamin/Cummings, 2000.